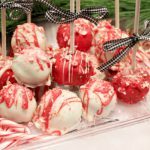 These Holiday Cookie Pops will put a smile on the face of Santa and all the little elves that crowd around your table. The kids will have fun helping and especially eating them when all the work is done. Editor's Note: Be sure that none of your little elves have a peanut allergy. Spread peanut butter onto the flat side of the cookies. Place an ice cream stick into the peanut butter on half the cookies. Top with another cookie so the stick is sandwiched between the two cookies. Melt chocolate chips (follow this link for directions and tips for working with chocolate). Dip cookie pops in the melted chips, covering completely. Roll pops in red and green sprinkles and lay or stand on waxed paper or paper plates. Place in refrigerator to chill. Snowmen -- Using a licorice whip, while chocolate is still warm on pop, form headband and position two regular sized M&M candies as ear muffs. Lie pop flat on waxed paper and let cool. When cool, use black decorator gel for eyes and mouth and orange for the nose. Gently wrap a fruit roll up around the bottom of the cookie at the stick. Santa -- While chocolate is still warm, dip top of pop into red sprinkles for Santa's hat. Lie flat on waxed paper and let cool. When cool, dot top of hat with white decorator icing using flower tip. Use flower tip and white icing to add his bear and line the brim of his hat. Use black decorator gel to dot on eyes. Holly -- While chocolate is still warm, position to red mini M&M candies off center in the chocolate. Let cool. When cool, use green decorator gel to draw on holly leaves, fill in. Note: You can tint the melted chocolate with food coloring, or leave the chocolate white and use different colored sprinkles. Decorate with any other candies you wish, or leave some plain. Another variation is to use vanilla or chocolate frosting instead of peanut butter for the filling. You can also make the cookies without sticks. Use one stick to be able to dip the cookies in chocolate and roll in sprinkles, then remove the stick and put on wax paper or paper plates, then chill.